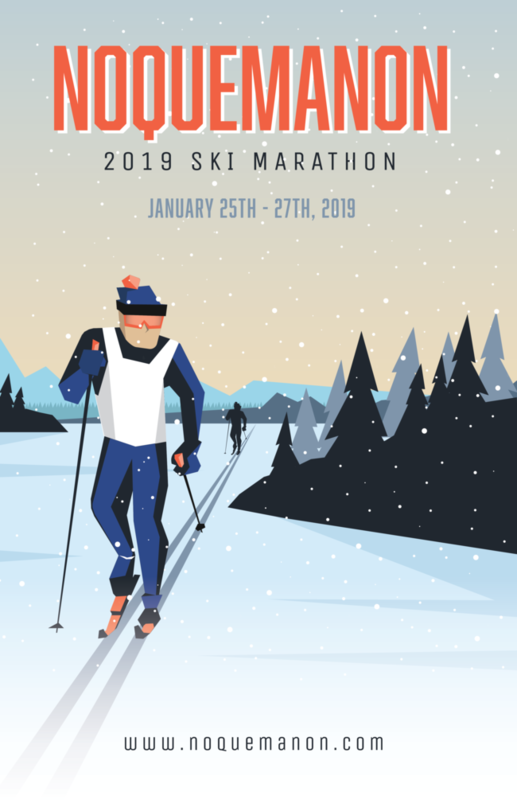 The race committee looks forward to hosting the 21st annual Noquemanon Ski Marathon January 25th-27th 2019 and is excited to keep you updated on event developments leading up to race day through this newsletter, our social media channels, and registered participant e-mail lists. We encourage you to stay connected with us over the next few months as details are made available. The Noque has become a fixture and is truly unique in it's location, terrain, passionate landowners and volunteers, and its non-profit status. If you've done the Noque before we encourage you to invite your friends to share in the experience. If you're still putting your event calendar together for the winter, we'd be honored to be on your list of events. The Noque is wilderness point to point skiing at it's best - rugged, beautiful, challenging, and often unpredictable. More and more, families are starting, or ending, a winter vacation with the Noquemanon. With all of the extensive ski trails, snowbike singletrack, and winter trail running available, Marquette has become the perfect basecamp for an extended winter adventure. In fact, USA Today rated Marquette the "Best Small Town For Adventure" in 2018. If you're considering sticking around, visit our friends at Travel Marquette - they can help you make your plans. We look forward to hosting you in January. Think snow! Youth (age 24 and under) get a $25 discount when signing up on line for 50K/24K/15 Mile events. 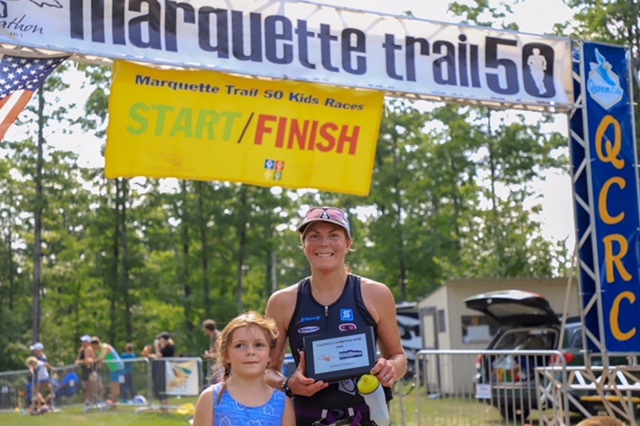 A few brave souls tackled both the full Noque (50K) in January and the Marquette Trail 50 (50K) in August to see who could cross the line with the fastest combined time. This was a new competition in 2018 between two premier NTN events and was reported to not only be fun, but also a game of strategy. Not only did competitors have to be fast, but they needed to leverage their individual skiing strengths to conditions as skiers could choose to compete in either classic or freestyle disciplines. Congratulations to all including our overall winners! The Noquemanon Isn't "Just" A Ski Marathon! 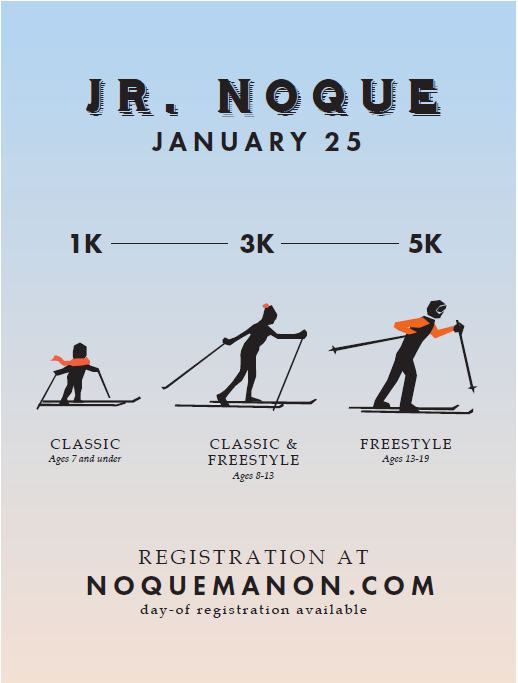 The Noquemanon Ski Marathon kicks off on Friday January 25th with the Junior Noque at the Forestville Trailhead. The kid friendly 1K and 3K are family favorites and the 5K is strongly contested among the teens and youth ski clubs. All Junior Noque events are very low cost! Registration forms are available HERE and day-of registration is welcome. 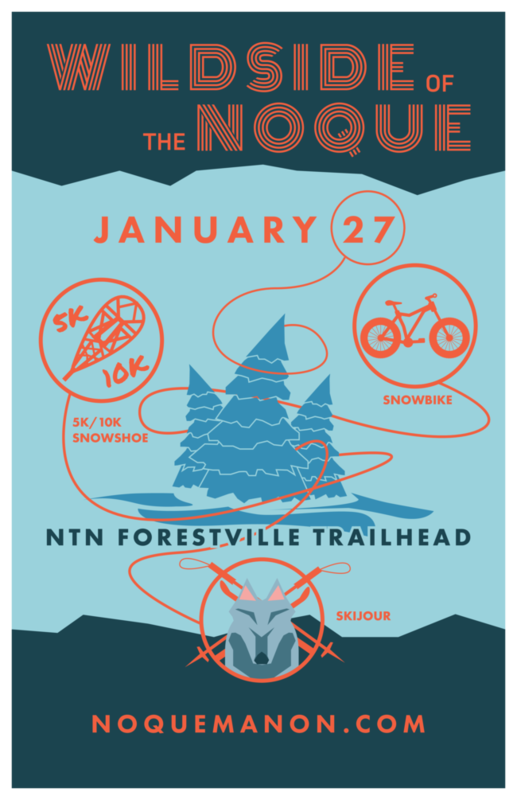 The Noquemanon weekend wraps up on Sunday January 27th with the spectator friendly Wildside of the Noque at the Forestville Trailhead. Three events are showcased - the Animoosh 1 and 2 dog skijour, snowbike, and 5K & 10K snowshoe races. In 1998, while searching the area for a ski trail, a survey map dated 1854 was unearthed. The survey map labeled the area, currently known as the Dead River Basin, in the middle of Marquette County, with the word, “Nakemanon”. The original French spelling of the word was identified as Noquemanon. Local historian Fred Rydholm stated in one of his books that the Noque band of the Chippewa Indians used the area as a summer home. The translation of the word “manon” is “berry lands of the tribe”. A local group of forward-thinking ski enthusiasts chose the name “Noquemanon” for the trail network and the signature Ski Marathon event. In January of 2001, the Noquemanon Trail Network Council (NTN) was incorporated as a 501c3 organization and public-private partnership representing governmental entities (local, state, and federal), recreational interests and organizations, the private sector, and private landowners. Today, the mission of the NTN is to develop and maintain an interconnected, year-round, non-motorized trail network in the central Upper Peninsula of Michigan. The network has grown to include over 75 km of groomed nordic ski trails at 5 locations across the region and well over 60 miles (100 km) of singletrack with 37 miles (60 km) groomed for snowbiking. The Noquemanon Ski Marathon and the Ore to Shore Mountain Bike Epic (sister events) have proven what can happen when trails are opened to the public. Both races, in their first three years, attained national recognition as premier events for cross country skiing and mountain biking. Together, the events now draw over 5,000 participants and generate over $2.5 million for the local economy each year. Both events are now celebrating more than two decades of success. 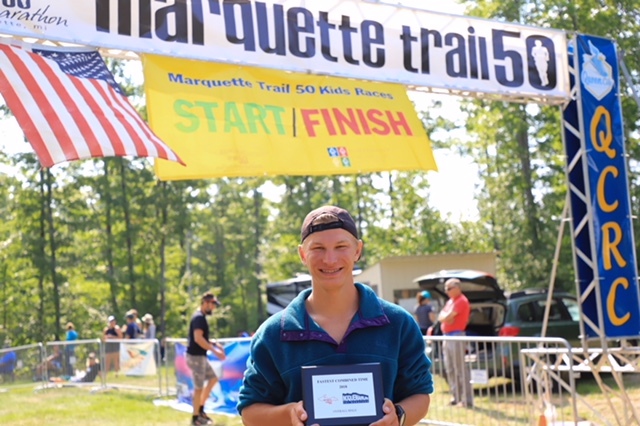 The NTN now hosts 7 premier events annually and each of these non profit events supports the NTN mission - building and maintaining silent sports trails. 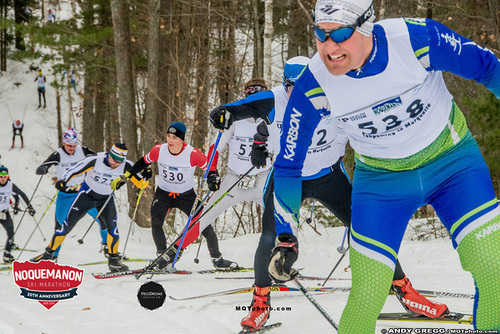 The Noquemanon Ski Marathon is pleased to continue to be a part of the CXC Marathon Cup Series. The 50K Classic race counts towards CXC Marathon Cup points. 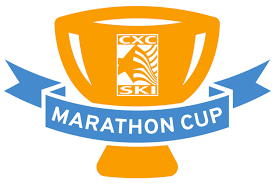 The CXC Marathon Cup connects the premiere cross country ski events across the Central region. Sanctioned and scored by Central Cross Country Skiing, presented by AVANT Techno, the Cup includes races in each of the three main states in the region - two races in Michigan, two in Wisconsin, and two in Minnesota. The 2019 series is split between classic and skate racing, with two classic races, three skate weekends, and one skiathlon weekend. The Noquemanon Ski Marathon continues a long tradition of being a part of the ASM Series. Beautiful backdrops in America's most incredible winter playgrounds...courses that both challenge veterans as well as welcome novices...unparalleled organization at every event...world-class racers and entire families all with smiles from ear-to-ear. This is the American Ski Marathon Series! Founded in 1978 as the "Great American Ski Chase". 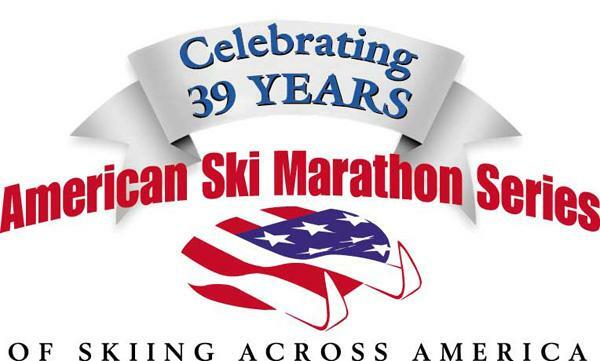 the American Ski Marathon Series (ASM) provides every level of cross country skier a thrilling chance to be part of a nationwide series of adventure, winter festivals and fun. Whether beginner, weekend warrior, casual tourer or professional racer -- every ASM event has something to offer you and your family.